Start off your day in a healthy way with this delicious 3-ingredient anti-inflammatory golden milk turmeric smoothie. 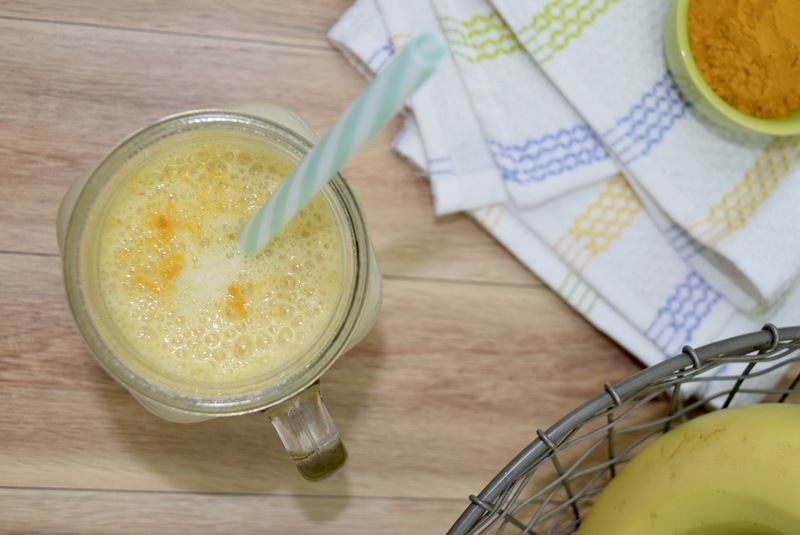 This rich and creamy smoothie is dairy-free, naturally sweetened with bananas, and contains a health dose of turmeric and honey, both of which are known to have amazing healing properties. The other day I was lounging on the couch after a lazy afternoon of watching random shows on Netflix. 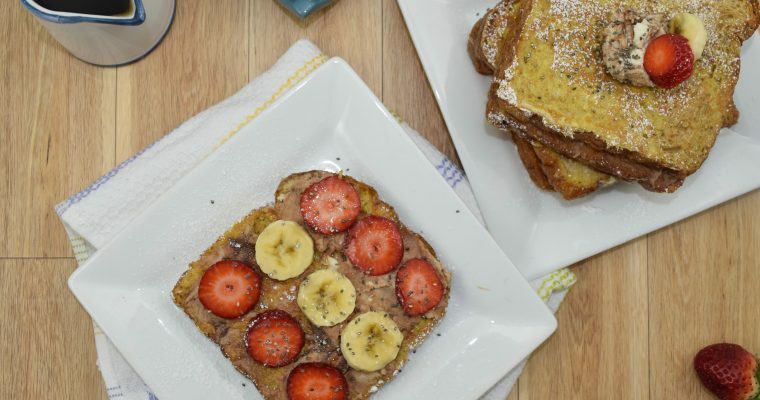 The kids were due to wake up from their naps, and of course snack needed to be prepped and ready to serve – otherwise I would be guilty of feeding into their post-nap hanger. And no mom wants to deal with that, especially after a relaxing afternoon. The kids love smoothies, and I love preparing them since it’s one of the easiest ways for me to incorporate veggies into their diet. It always baffles me how (as of late) they will not touch greens with a ten-foot pole, yet when I divulge the ‘secret’ – that their smoothies are usually made with spinach and kale, they devour them. This smoothie on the other hand was about the vibrant colour yellow. Golden milk is essentially milk laced with turmeric, a potent anti-inflammatory spice that has a myriad of therapeutic properties. Turmeric works well in savoury dishes however, a touch of it in sweet recipes adds a depth of flavour, and transforms this simple smoothie into a powerful immune boosting drink. This vegan smoothie recipe is made with coconut milk however any milk will do. 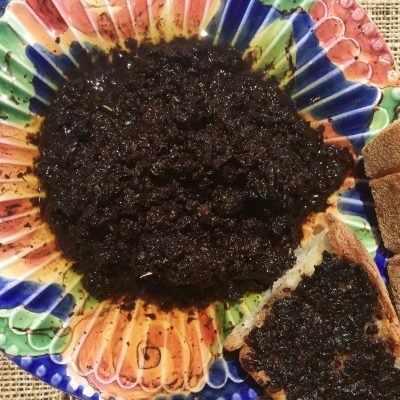 Since turmeric has such a potent flavour it’s essential to add sweetness to the mix in order to mask some of the bitterness, hence the ripe bananas and honey. The peanut butter was an after thought and can be omitted entirely however, I avoided reducing the healthiness of this drink by adding pure peanut butter powder which is low in sugars and much healthier than it’s packaged counterparts. As for the turmeric, if you’re unfamiliar with the spice, my suggestion is to start by adding a small amount then incorporate more, depending on your tastes. Combine all the ingredients in a large food processor or Vitamix and blend until smooth and creamy. Serve immediately. Alternatively, add some ice for a refreshing summer time treat. This looks delicious. I need to try this with my kids for breakfast. Turmeric is very healthy as it contains high doses of antioxidants which can help remove free radicals in the body. Drinking a turmeric smoothie is refreshing especially on a warm day. I like its flavor and texture too. Very true that it’s refreshing! This has become one of my favorite things to make lately. I love the taste and find it really ironic that after all these years of using turmeric, I am just finding out what the natural root actually looks like. I however, liked the texture better when I used the powder but good either way. Oh you use peanut butter powder in yours. That is different. Super healthy and good for you. Me too! I only started buying the root about 6 months ago. Now, if I buy the powdered variety, I always make sure it’s TOP quality! I love smoothies! I have never tried turmeric in milk or anything else, so I don’t know how it would taste. However, I know that people are finding tons of health benefits behind it! I should give it a try. I have never tried tumeric but this seems like a really great reason or two that I should try it. Thanks so much for sharing! I am determined to make 2017 my best year yet healthwise, which means that I just might have to step outside of my comfort zone from time to time with what I eat. I can’t seem to get enough smoothies, but I just don’t know where I’m at with the Golden Milk. I guess a smoothie would be the best way to give it a try! Good for you Kristy…so am I! I think a smoothie is a great way to incorporate new ingredients into your diet. 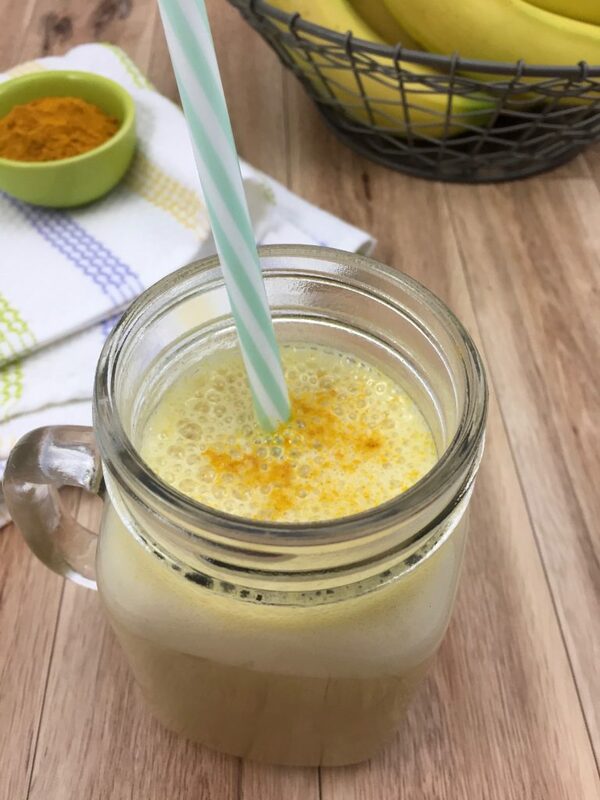 I got my friend onto turmeric smoothies…she has one every day now! I first learned about Golden Milk on another blog last week. I think it sounds incredible. I deal with a lot of inflammation and if it could help I’m up for it. I’ve had my dad on Turmeric for awhile and he likes it. It’s helping him.I’m just glad you use Coconut Milk since I’m lactose intolerant. This looks fantastic! All of my smoothies end up being green and gross looking (despite being delicious). I really think that I would enjoy this. Haha! So true! This one is actually pretty to look at! I have read so many great things about incorporating Tumeric into your diet. I think adding it to a smoothie would be the perfect way to start with a new flavor and addition. I am going to have to try this. I bet my kids would even drink it. I have never heard of Golden Milk before but I am a huge advocate of turmeric! This sounds like something that is right up my alley! I appreciate that you are spreading knowledge on turmeric and giving people like me a new way to use it. Since you love turmeric this would be perfect for you! And, thanks! You had my attention when you said anti-inflammatory. I am not familiar with the flavor of turmeric but am willing to give it a try especially if it can heal and help inflammation. I could do with some immune boosting especially since I have an autoimmune disorder. I’m writing turmeric on my grocery list. That’s great! Read more about it…it works wonders for the body (and skin! ).